Preheat the oven to 350°. Coat a 10-inch round cake pan with nonstick spray and line with parchment paper. In a saucepan, cover the dates with 1 cup of water; bring to a boil. Remove the pan from the heat and whisk in the baking soda; it will foam up. Let cool slightly. In a medium bowl, sift the flour with the baking powder and salt. In a stand mixer fitted with the paddle, beat the butter with the granulated sugar at medium speed until light and fluffy, 1 to 2 minutes. Beat in the eggs and vanilla. In 2 alternating batches, beat in the dry ingredients and the date mixture until just incorporated. Scrape the batter into the prepared pan and bake for 35 to 40 minutes, until a toothpick inserted in the center comes out clean. Let the cake cool in the pan for 10 minutes. In a medium saucepan, bring the brown sugar, butter and heavy cream to a boil over moderate heat, whisking to dissolve the sugar. Simmer over moderately low heat, whisking, for 2 minutes. Remove from the heat; whisk in the brandy, vanilla and salt. Keep warm. Turn the cake out onto a rack and peel off the parchment. Carefully return the cake, top side down, to the pan. Using a skewer, poke 15 to 20 holes in it. 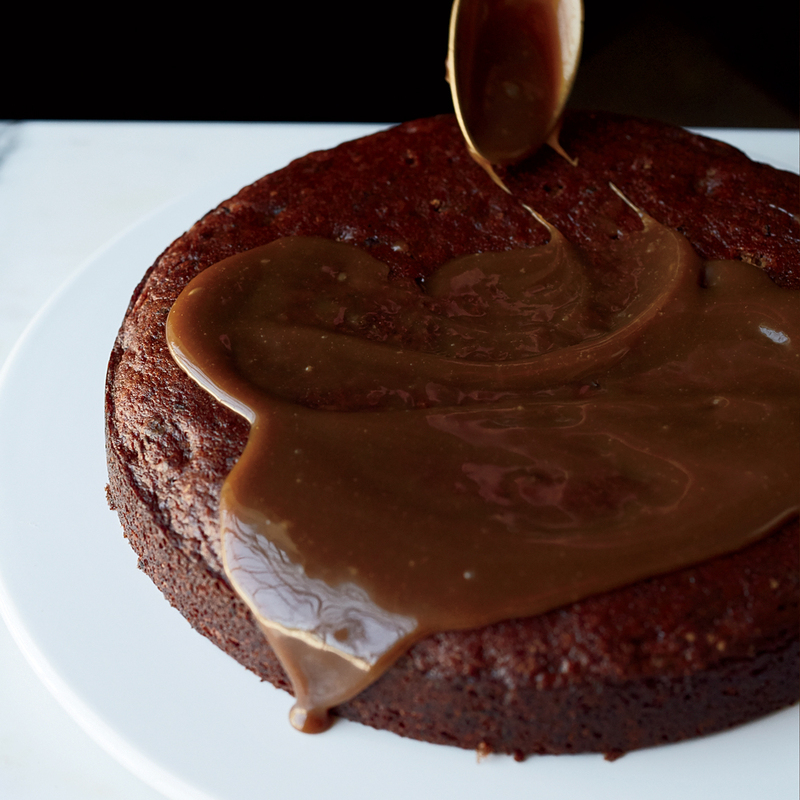 Pour half of the warm sauce over the cake and let stand until absorbed, about 5 minutes. Invert onto a platter and poke another 15 to 20 holes in the top. Pour the remaining sauce over the top. Serve warm. Vanilla ice cream or crème fraîche. Review Body: I've made this cake twice for guests and every time we lick the plate clean, its so yummy! And easier than it sounds. Add whipped cream to the top to make it extra decadent.